What: Nely Galán, media entrepreneur, Sandra Cisneros, award-winning author and Nell Merlino, Founder and President of Count Me In for Women’s Economic Independence will be the headliners in Houston, Texas, the next stop of The Adelante Movement: Tour on October 27. The Tour is a national series of live forums, presented by Coca-Cola, that bring together Latinas from around the country to inspire them to take action and to connect them with financial opportunities such as government contracts, franchises, jobs, start-up capital and corporate diversity contracts in order to create wealth and prosperity for their families and their communities. In addition, Nely Galán will deliver the keynote speech during the conference luncheon prior to the Adelante forum. Join the Adelante community: www.theadelantemovement.com. The Adelante Movement Houston forum is presented in association with the Latinos in Social Media (LATISM) conference. Attendees must be registered for the LATISM conference. Click here to register. 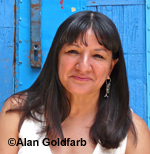 Sandra Cisneros, acclaimed novelist, poet, educator and Latina advocate who has been awarded the MacArthur Genius Award. Her critically acclaimed novel “The House on Mango Street” has sold over five million copies in the U.S. and won her numerous awards. Sandra’s new project “Have You Seen Marie?” is an illustrated book for adults, with illustrations by Ester Hernández. She is also writing several projects, including a book of essays as autobiography, a collection of short stories, a book about writing and a new book of poems, among others.. www.sandracisneros.com. Latinos In Tech Innovation and Social Media (LATISM), a 501(c) 4 nonprofit, nonpartisan organization dedicated to advancing the social, civic and economic status of the Latino community. Founded by @AnaRC. At the heart of Latinos in Tech Innovation & Social Media (LATISM) is a commitment to integral action for and by Latinos. We believe in community action and our mission is the manifestation of that commitment. LATISM seeks to equip our members with the tools they need to transform their communities by integrating community and networking resources that enable our members to make choices, take part in actions and decisions that affect their lives, and become agents for change. The Coca-Cola Company (NYSE: KO) is the world's largest beverage company, refreshing consumers with more than 500 sparkling and still brands. Led by Coca-Cola, the world's most valuable brand, our Company's portfolio features 15 billion dollar brands including Diet Coke, Fanta, Sprite, Coca-Cola Zero, vitamin water, PowerAde, Minute Maid, Simply, Georgia and Del Valle. Globally, we are the No. 1 provider of sparkling beverages, ready-to-drink coffees, and juices and juice drinks. Through the world's largest beverage distribution system, consumers in more than 200 countries enjoy our beverages at a rate of 1.8 billion servings a day. With an enduring commitment to building sustainable communities, our Company is focused on initiatives that reduce our environmental footprint, support active, healthy living, create a safe, inclusive work environment for our associates, and enhance the economic development of the communities where we operate. Together with our bottling partners, we rank among the world's top 10 private employers with more than 700,000 system employees. For more information, please visit www.thecoca-colacompany.com or follow us on Twitter at twitter.com/CocaColaCo.